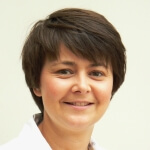 Susan Robinson has been a consultant haematologist at Guy’s and St Thomas’ since 2010. She is the lead consultant for patient blood management, pre-operative and post-operative correction of anaemia, transfusion medicine, immune thrombocytopenia and obstetric haematology (anaemia, thrombocytopenia, thrombosis, antiphospholipid syndrome, myeloproliferative neoplasms in pregnancy). She is chair of the British Society of Haematology Transfusion Task Force, co-chair National Blood Transfusion Committee anaemia working group, writing group member NICE Transfusion Guidelines, specialist committee member NICE quality standards for transfusion. Susan has published more than 40 peer reviewed papers, book chapters and articles and lectures throughout the UK and internationally.